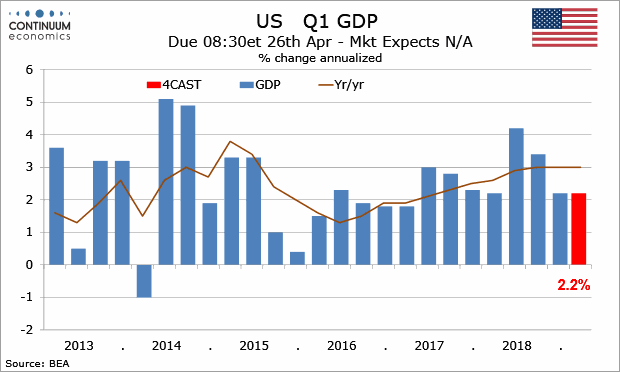 We have upgraded our Q1 US GDP forecast to 2.2%, up from 1.2% a month ago, though the picture is mixed and still very uncertain. Our expectation for consumer spending has actually gone down with a rise of only 0.7% seen. Jan personal spending data was weaker than retail sales implied. Despite our weak forecast, we assume an upward revision to Jan before a subdued Feb, and stronger growth in Mar. However a sharp fall in Dec meant the quarter got off to a very weak start. 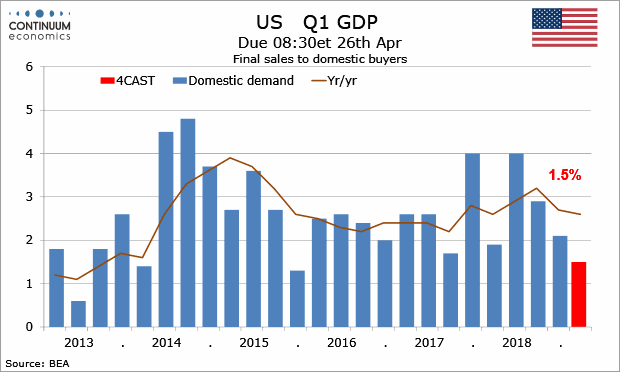 There will be extra uncertainty with Feb consumer spending data not scheduled until after the first Q1 GDP estimate, though we will have seen retail sales data through Mar. This adds to uncertainty over services, which we expect to rise by 2.2%. Durables should fall by 9.6% on weak auto sales in Jan and Feb, though Mar did see a bounce. 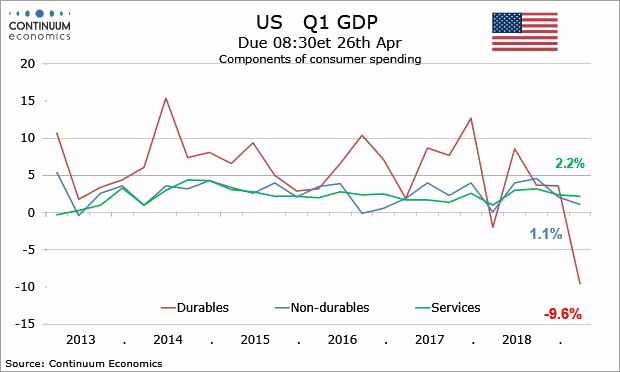 Non-durables should rise by a modest 1.1%. 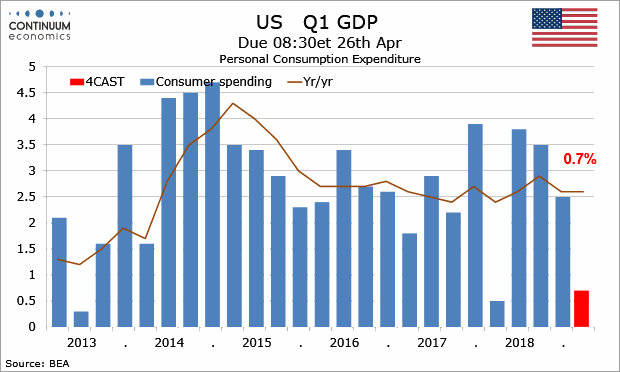 Real disposable income should report healthy growth of 2.7%, suggesting the Q1 slowing in consumer spending will not be sustained. 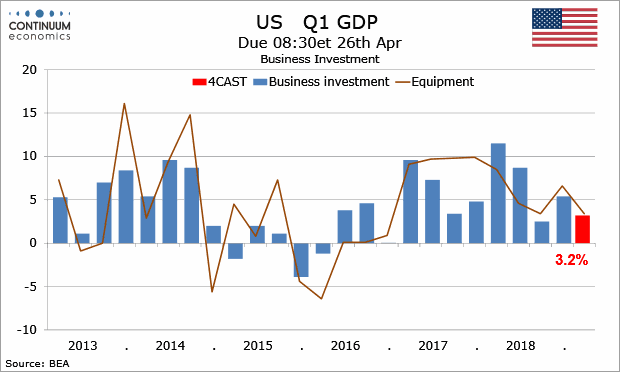 Business investment should see a modest increase of 3.2% after a stronger 5.2% rise in Q4 that was led by what looks like a difficult to sustain surge in intellectual property. Signals on non-residential construction are marginally negative and signals on equipment marginally positive. Public construction spending, led by state and local government, is looking strong, and we expect an above trend 3.7% rise from government. Despite some lingering impact from the government shutdown, we expect defense to continue to support Federal government spending. 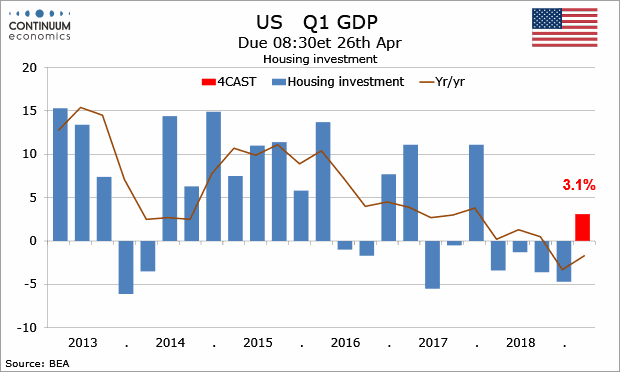 While final sales to domestic buyers (GDP less inventories and net exports) should outperform consumer spending, our 1.5% forecast is down from 1.9% a month ago. 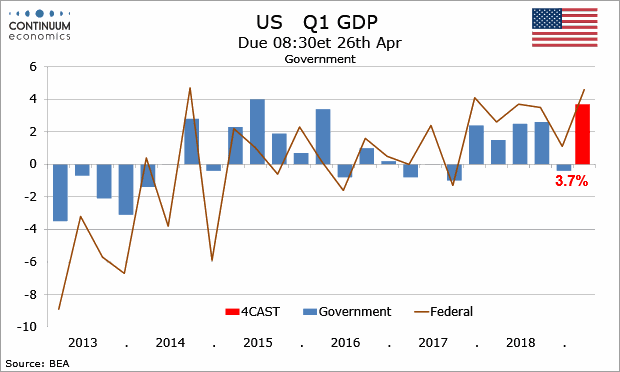 The upward revision to our forecast has been led by inventories and net exports, where data are available only for Jan, meaning the picture remains highly uncertain. 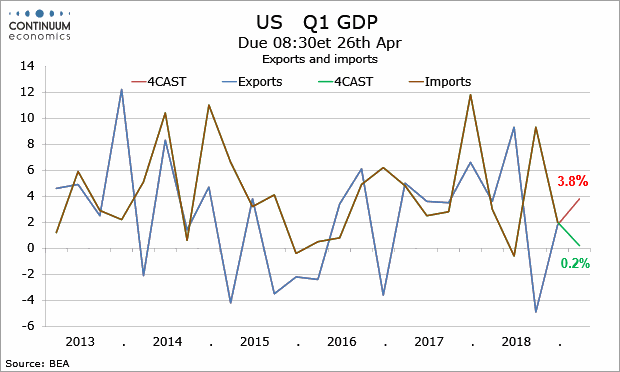 A narrower Jan trade deficit has us expecting exports to rise by 3.8%, assisted by resumption of soybean exports to China, while imports should rise by 0.2%. 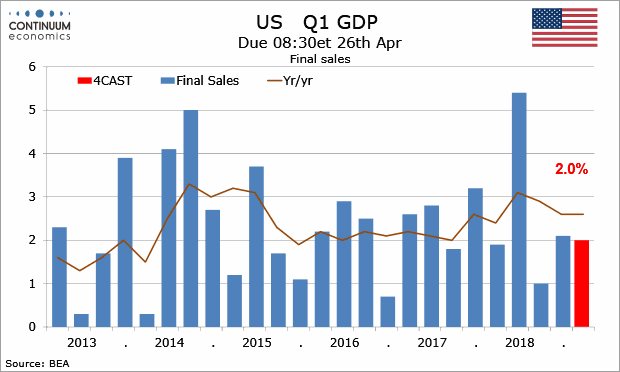 Final sales (GDP less inventories) should rise by 2.0%, meaning a positive contribution of 0.5% from net exports. We assume wider deficits in Feb and Mar, though our Feb forecast is narrower than the consensus. At the start of the quarter we assumed inventories would be trimmed after two quarters of strong growth. However, Jan data was very strong. 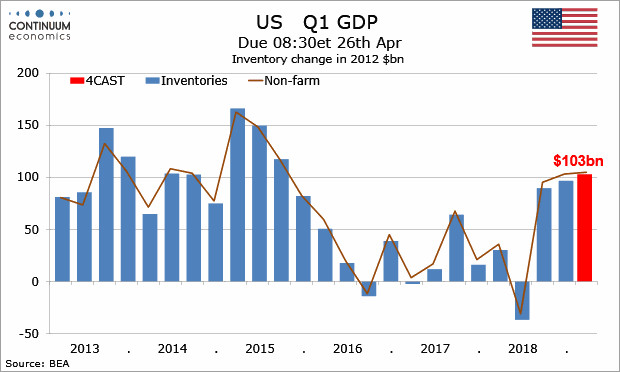 Inventories still look due for a trim at some point, with the Jan rise looking like an involuntary response to weak consumer spending, but we currently expect a positive contribution to Q1 GDP of 0.2% from inventories. 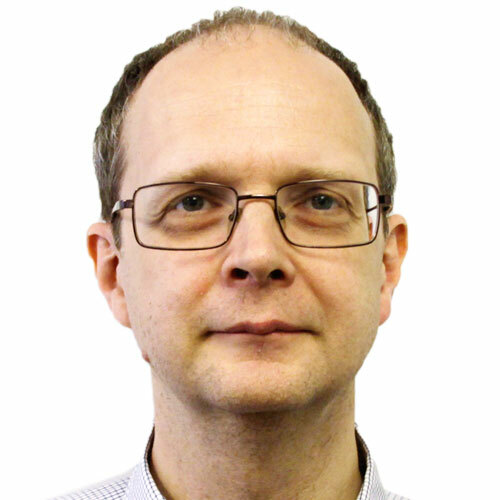 I, David Sloan, the lead analyst certify that the views expressed herein are mine and are clear, fair and not misleading at the time of publication. They have not been influenced by any relationship, either a personal relationship of mine or a relationship of the firm, to any entity described or referred to herein nor to any client of Continuum Economics nor has any inducement been received in relation to those views. I further certify that in the preparation and publication of this report I have at all times followed all relevant Continuum Economics compliance protocols including those reasonably seeking to prevent the receipt or misuse of material non-public information.